Window W : the number of points on which the FFT is performed. We use 16384 points (2 to the power 14). Overlap OV : 90% of W which means ~ 14776 points are considered (0.9 x 16384). This is the number of common points used in two consecutive FFT. It is used to smooth the spectrogram. With these numbers, the time resolution is given by W/S ~ 3 seconds. However, the number of columns (pixels along x-axis) in the spectrograms is given by (N-OV)/(W-OV) ~ N/0.1W in case of a 90% overlap ~ 1000, which gives an "apparent time resolution" of the order of 0.3 seconds (~300/1000). This is done only to improve the appearance of the spectrogram. The spectrograms generated are PNG images and have a typical size of ~ 200 KB. Note that the spectrograms generated in the BRAMS viewer have a dynamical range for power, which means that the color code visible on the right hand side of the spectrogram depends on the minimum and maximum values of the spectrogram. This can be sometimes a problem when there are very bright pixels or if the level of the noise in the image is large. The units of the power are in dBFs (decibels relative to full scale, 0 dBFs = maximum value). 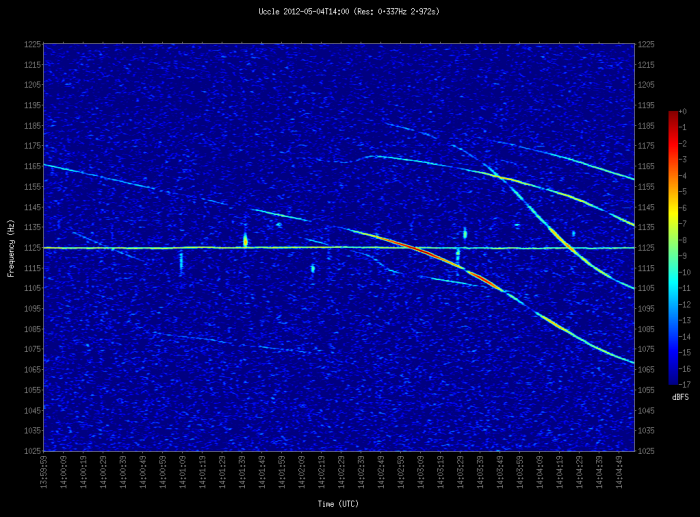 Short vertical lines are meteor echoes. 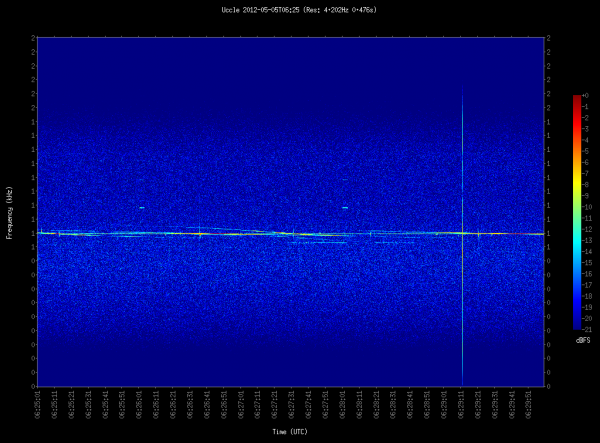 On this spectrogram there are 12 meteor echoes clearly visible. Most of these are probably underdense meteor echoes with a short duration (just a fraction of a second). However, on the spectrogram it is not possible to confirm it without ambiguity as the time resolution of the spectrogram is approximately 3 seconds. To confirm this, we must isolate the frequencies covered by the meteor echo and run an inverse FFT to look at the meteor profile (power versus time). 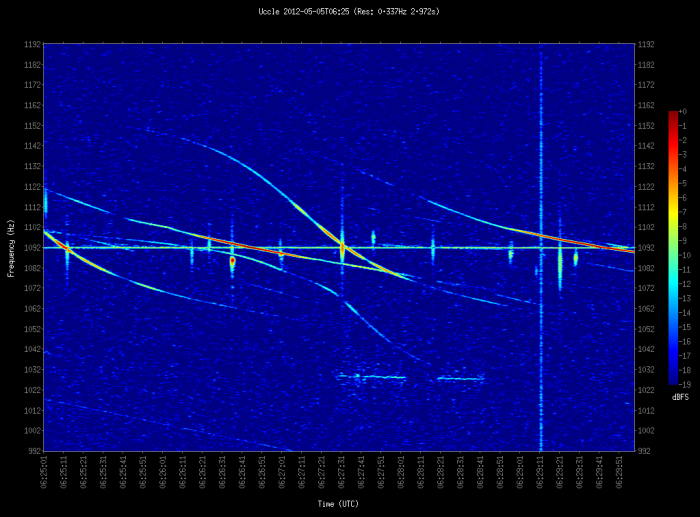 The long vertical line at 06:29:11 UT is a parasitic echo. 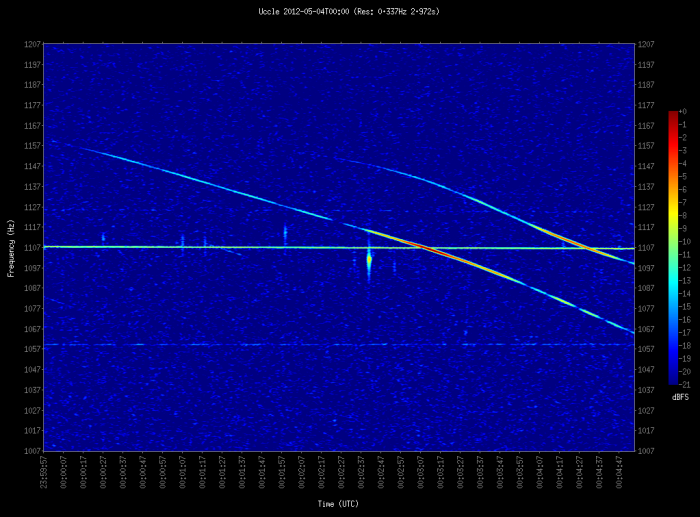 It is easy to discriminate from meteor echoes as it covers the whole 200 Hz range. Actually when we change the range of frequencies (see spectrogram below), we see this parasite is actually broadband covering from 0 to above 2 KHz. Long-lasting echoes with a sort of "S-shape" are reflexions on planes illuminated by the beacon. The S-shape can be explained simply by a double Doppler effect (from the plane moving in relation to the beacon and also to the receiving station). The classical S-shape is obtained for planes moving in straight line while for those changing directions, the form of the echo can be more complicated. In the example above, at least six echos on planes are recorded. We recommend to use a frequency range of 200 Hz centered on the frequency of the beacon (direct signal). If you have set up the frequency of the local oscillator at 49.969 MHz (1 KHz below the frequency of the Dourbes beacon), the frequency of the beacon should in principle appear around 1000 Hz in the spectrograms. In practice, the accuracy of the frequency of the local oscillator in the ICOM receiver is within a few tens of Hz and varies with the temperature. 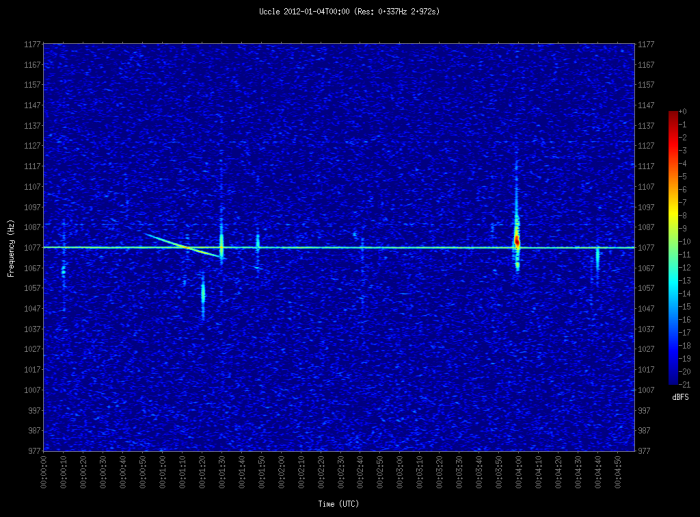 So the frequency of the beacon typically appears above 1 KHz (see example above where it appears at 1092 Hz). This frequency shift may also change with time, due to temperature effects in the receiver. This can be clearly seen between summer & winter spectrograms or simply between day & night. To avoid these effects as much as possible, it is recommended to place the receiver in a room more or less controlled in temperature. Below are some examples of spectrograms obtained at BEUCCL on May 4 2012 at 0:00 UT and 14:00 UT, and on January 4 at 0:00 UT. The frequency of the beacon appears respectively at 1107 Hz, 1125 Hz and 1077 Hz, illustrating the influence of the temperature on the receiver.